CHARLOTTE, North Carolina – September 30, 2016 Ecomdash, an ecommerce automation software system, announced today its latest integration: Intuit QuickBooks Online. The addition of the cloud-based accounting platform represents a major step forward for the platform whose goal is to offer unmatched value for functionality in ecommerce inventory management. Ecomdash will function as a QuickBooks Online inventory management system. 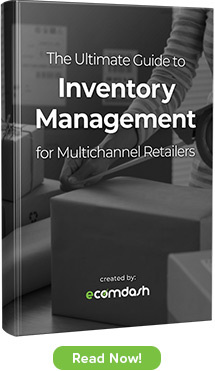 Learn more about Ecomdash’s QuickBooks Online inventory management system integration. The new integration will allow Ecomdash customers to push sales orders from each of their channels to QuickBooks Online, where the sale will be converted into a QuickBooks sales receipt. The receipt will automatically correlate to the corresponding product in QuickBooks. This process also manages the creation of products and customer profiles in QuickBooks Online. Combined with Ecomdash’s current functionality of syncing inventory, routing sales orders, managing product listings, and hands-off communication, the addition of cloud accounting with QuickBooks Online places Ecomdash firmly in the upper tier of inventory management software systems. “We want to allow our customers to save time, scale their business, and drive sales by automating their back-end supply chain. The addition of cloud accounting is fundamental to that offering,” said Maglosky. Other recent upgrades from Ecomdash include support for multi-warehouse selling, integrations to ShipStation and Jet, and a Fulfillment by Amazon inventory integration scheduled in time for the holiday selling season. Ecomdash is a software service that streamlines backend operations for ecommerce sellers. Ecomdash automates and integrates omni-channel retailers’ inventory, sales orders, product listings and shipping processes across marketplaces like Amazon, eBay, and Etsy as well as ecommerce-ready website platforms like Bigcommerce, Shopify, and Magento. Ecomdash gives merchants the ability to save time, grow sales, and increase customer satisfaction. For more information visit ecomdash.com. Thank you for your kind words. We will continue to work hard and make running ecommerce businesses easier for our customers.